This sermon was preached on the occasion of the installation of Br. James as Master of the Anglican Order of Preachers. The sermon is based on Genesis 32:3-31. 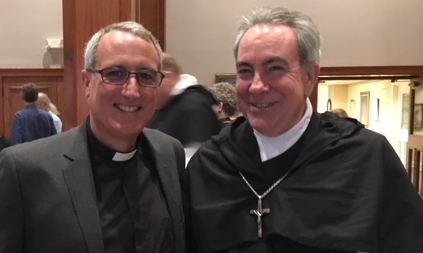 The first thing I need to say is to acknowledge with love and gratitude the life of Bishop Hibbs, his wisdom, and his influence not only in your life Br. James, but in the life of this diocese. I trust his spirit is present and among us this evening. I am confident that when, in just a little bit, we join the heavenly chorus in the eucharistic prayer our words and his words will be spoken with one voice. And I am grateful for that. So here it is: “Deliver me, please, from the hand of my brother” (Genesis 32:11).That was a part of Jacob’s prayer and I hope it will become a part of your prayer as well Br James. We should, however, add “and my sister.” Deliver me, please, from the hand of my brother and sister. Jacob is about to meet Esau, his estranged brother. He is afraid, distressed, and outnumbered. “Deliver me, please, from the hand of my brother, from the hand of Esau,” he prays (Genesis 32:11). Jacob surely offers this prayer with memories of deceptions, a stolen blessing, lies, broken relationships, and betrayal swirling in his mind. At one level Jacob’s prayer expresses his concern for physical safety and his fear of Esau’s revenge. But I think there is a deeper level to this prayer. That’s what I want you to hear and consider. Jacob came into this world grasping at his brother’s heel. All his life Jacob has wanted to be and have who and what Esau is and has. He bought Esau’s inheritance with a bowl of soup and he stole Esau’s blessing, all with the hope of having Esau’s life. And he now recognizes the threat that has become and the consequences it has brought about. It’s about more than a physical threat. For Jacob to live Esau’s life means he will lose himself. There will be no more Jacob. Don’t lose yourself in becoming Master of the Order. Neither should you find yourself in becoming Master of the Order. Instead, bring your truest and most authentic self to the work and position. Here’s the twist. That means being delivered from the hand of Esau so you can be his brother. We all have an Esau. Individuals, communities, parishes, religious orders, nations, you, and me – we all have an Esau. I am not talking about a literal Esau but a symbolic and metaphorical Esau. That does not mean, however, that Esau is not real. He is absolutely real. Esau is the face of our past guilts and regrets. Esau is the temptation to believe that we are not enough and we need to be someone or something else. Esau is our fear of the future. Esau is the one with whom we wrestle in the depths of our soul to discover our true name and identity, and to find the blessing that is uniquely ours. To be delivered from the hand of this Esau is the beginning of your own brotherhood, unity, and well being. This is not the defeat or rejection of Esau. Instead, it is the reconciliation of siblings. Deliverance from the hand of Esau means Esau is free to be Esau and Jacob is free to be Jacob. When we are free to become ourselves everything changes. Life is fruitful, love is expansive, peace reigns, generosity abounds, beauty radiates, and God’s life is revealed. A few highlights from the chapter that immediately follows today’s reading illustrate what I mean. Do you remember what happens? 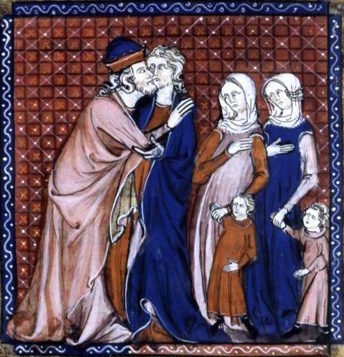 Esau runs to Jacob, embraces him, kisses him, and they both weep (Genesis 33:4). Reunion has replaced revenge. Esau doesn’t bring up the past or lay claim to what Jacob had taken from him. He wants only one thing, his brother. “I have enough, my brother” (Genesis 33:9), he says to Jacob. My brother. With those words Esau gives Jacob back a piece of himself. Maybe for the first time Jacob recognizes who Esau really is. He tells Esau, “For to truly see your face is like seeing the face of God” (Genesis 33:10). Jacob no longer needs or wants Esau’s life and blessing. Wrestling in the dark of the previous night he found his own and tells Esau, “I have everything I want,” and he offers Esau gifts (Genesis 33:11). How different is that from the way their lives began? Esau responds, “Let us journey on our way, and I will go alongside you” (Genesis 33:12) One does not walk in front of the other. There is no more grasping at heels. They go side by side. Who is your Esau, Br. James? What is your Esau? In what ways do you need to struggle and wrestle with Esau in order to become more fully yourself? To become a real brother? Who or what is the Order’s Esau? It would be a mistake to hear that line about unity and well being as your job description, a to do list for the benefit of the Order. It is, rather, descriptive, not so much of what you are to do, but how you are to be. Your presence and way of being will have more influence and authority than anything you could say, decide, or do. Unity, and spiritual and temporal well being are not goals to be achieved or tasks to be completed, they are virtues to be practiced, to be embodied, to be lived. They are less about your leadership of the Order and more about the condition of your heart. You will no doubt be called upon to speak words, make decisions, and take action in your role as Master of the Order. Your words, decisions, and actions will not determine or create unity or spiritual and temporal well being. Rather, the condition of your heart, your unity and your spiritual and temporal well being, will determine and give life to the words you speak, the decisions you make, and the actions you take. That means your first and foremost work as Master of the Order is to cultivate, grow, and preserve your own unity and well being; to be delivered from the hand of Easu. This is your interior work and it will be revealed in the life of the Order. When you have these things within you, you give the Order a path to follow. You invite the brothers and sisters into their own unity and spiritual and temporal well being. You cannot give the them what you do not have. You cannot take them places you have not already been. Give them the opportunity and a reason to live like you. I am not saying anything new or original. These are not my ideas. This is the monastic way. This is the wisdom of Abba Poeman. The Order doesn’t need your words, your decisions, or your actions as much as it needs you. The members of the Order want and need a brother. Even though they elected you to be their Master, be their brother not their master. Unity and well being, Esau and Jacob, wrestling in the night, deliverance and brotherhood, Abba Poeman, brother or master. Think on these things Br. James. Pray on these things. And may God deliver you from the hands of your brothers and sisters. Someone asked me about the reference to Bishop Hibbs. He was supposed to have preached at the installation of Br. James. However, he died in April of this year. Memory Eternal! May his soul and the souls of all the departed, through the mercy of God, rest in peace.